Captain Walter Starck blows past a German Me 109 that he has just damaged on July 1, 1944. 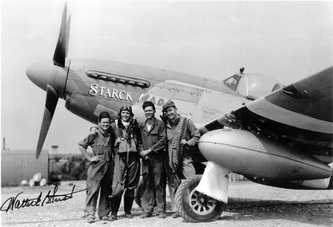 Starck was leading the 352nd FG when controllers vectored him to an air battle that was already in progress. Upon arriving at the scene, Starck quickly dispatched one of the enemy 109s and damaged this second aircraft before it ducked into a cloud. His wingman, Lt. Sheldon Heyer, narrowly missed colliding with Starck's first victim as the Nazi pilot baled out. Heyer noted that the second Me 109 started smoking before it entered the clouds. 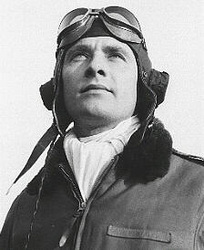 Wally would run up his score to seven confirmed air-to-air victories before he was forced to bale out over Germany. 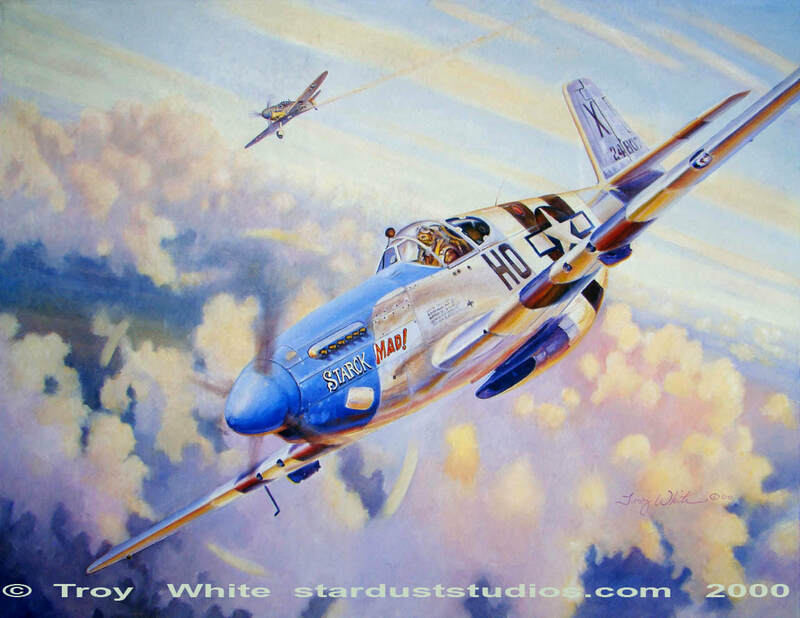 The last mission of his second tour was to be the big mission to Merseberg, on November 27, 1944. This was Capt. 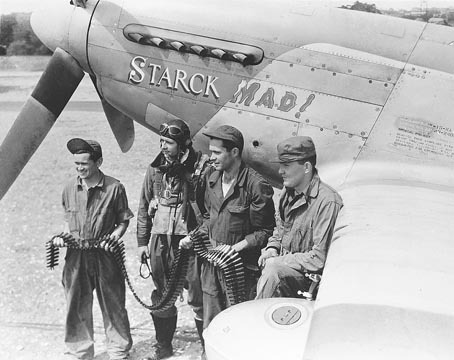 Starck's 106th mission and he got into a scrap shooting down two Me 109s in the vicinity of Hameln. A few minutes later over Osnabruck he scored a hat trick when he destroyed a third 109 but did not get a chance to celebrate because the tail section broke away from his last victim and struck his Mustang damaging his oil and coolant lines. Wally was forced to bale out. He was flying a borrowed airplane, Lt. James Bateman's "Buzz Boy" HO-F 44-14794. He was also using Bateman's parachute. The main lift web on the parachute rig was not adjusted to fit Wally so when the parachute opened he got smacked in the face with the chest strap buckle. He spent the remainder of the war as a POW at Stalag Luft 1, Barth Germany. Starck's awards include the Air Medal with four Oak Leaf Clusters, The Distinguished Flying Cross with three Oak Leaf Clusters and the Purple Heart. He remained in the Air Force and retired as a Colonel in 1965. Photos copyright ©352nd FG Association via Sam Sox . Used with permission.